The Minnesota Wild have landed one of college hockey’s top undrafted free agents. Clarkson center Nico Sturm, 23, signed a one-year contract with the Wild on Monday, just a few days after the Golden Knights’ season ended with a 3-2 overtime loss to Notre Dame in the first round of the NCAA tournament. 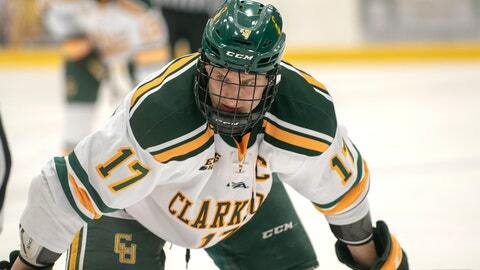 The 6-foot-3, 211 lb forward led Clarkson in scoring with 14 goals and 31 assists (45 points) as a junior, averaging 1.18 points per game, while winning 58.5 percent of his faceoffs. A native of Augsburg, Germany, Sturm was a top-10 finalist for the Hobey Baker Award — presented to the top men’s player in Division I — and was named the ECAC’s best defensive forward. A point-per-game player throughout his three-year college career, Sturm racked up 36 goals and 67 assists (103 points) and a plus-47 rating in 118 games at Clarkson.